This Ultimate Molecular Gastronomy Kit has everything you need to master techniques and ingredients that will have them talking about your next dinner party for months. A comprehensive 250-page guide book will help you discover the secrets of Molecular Gastronomy in no time. Unlike other kits we provide an ample amount of 24 ingredients for the home cook along with the tools you will need. And you get FREE access to our technical support if you have any questions when using the ingredients. 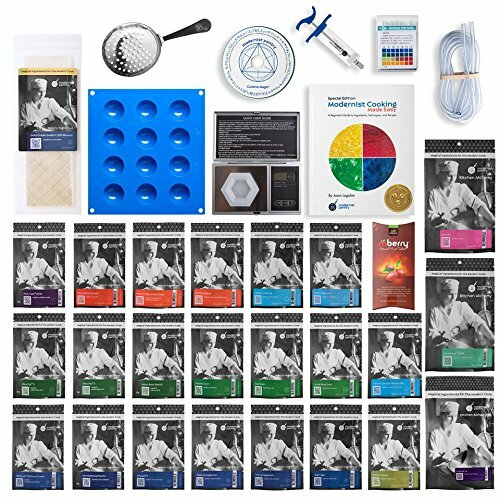 The ULTIMATE Molecular Gastronomy Made Easy Kit includes the following: a 250-page Recipe & Instruction Guide, 50g Super Agar, 50g Kappa Carrageenan, 50g Iota Carrageenan, 50g Methocel F, 50g Glycerin Flakes, 50g Kelcogel F Low Acyl Gellan Gum, 50g Sodium Alginate, 50g Calcium Chloride, 50g Calcium Lactate Gluconate, 50g Sodium Citrate, 50g Soy Lecithin Powder, 50g Xanthan Gum, 50g N-Zorbit Tapioca Maltodextrin, 50g Konjac Gum, 200g Isomalt, 50g Versawhip 600k, 50g Sucrose Esters, 50g Low Methoxyl Pectin, 50g Locust Bean Gum, 50g Ultra-tex 3, 50g Ultra-tex 8, 50g Guar Gum, 50g Pure-cote B790 or 50g Crisp Film, 20 Gelatin Sheets, 10 Miracle Berry Tablets, Perfect Caviar Maker, Spherification Spoon, Spherification Mold, 6' Spaghetti tubing, 100 pH Test Strips, 3 Anti-static Weighing Dishes, and High-Precision Digital Ingredient Scale. Compare this to any other kit on the market and you will see that Super Premium Molecular Gastronomy "Made Easy" is the absolute best value. What's more it comes with a 100% Money-Back Satisfaction Guarantee. Even though Amazon does not normally accept returns of grocery items, we will refund the full purchase price if you are not happy with this kit for any reason. Plus for a limited time the kit comes with a Bonus CD containing 300 additional recipes.